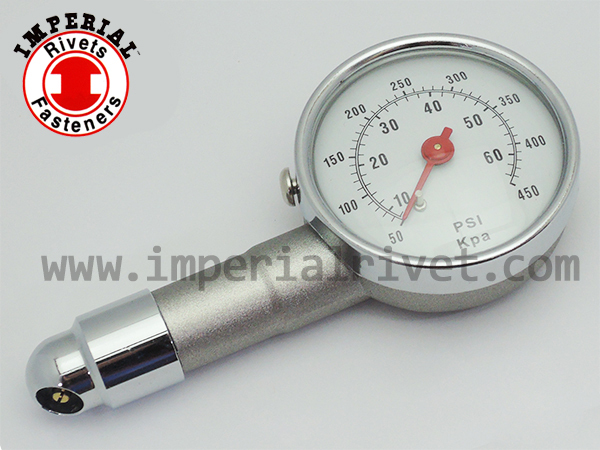 TSB-5114 Dial Type Tire Gauge-IMPERIAL RIVETS & FASTENERS CO.,INC..
HAVE YOU CHECKED YOUR TIRES? TIRE PRESSURE IS IMPORTANT IF YOU ARE PERFORMANCE MINDED OR JUST LOOKING FOR THE BEST RIDE YOU CAN. WE ALL KNOW TIRE PRESSURE AFFECTS PERFORMANCE AND GAS MILEAGE. THIS HIGH QUALITY TIRE GAUGE IS THE BEST WAY TO DIAL IN YOUR TIRE PRESSURE. 4.Suitable for most cars, trucks, motorcycles and bike...etc. 5.The normal vehicle maintenance, tire pressure should be measured once a month. 4. Add gas when pressure is slow or vice versa. 5. After the measurement, screw off the copper head and press the air bleeder to make the indicator to 0. screw up the valve of the tyre. ★ SCALES (Bar, kPa, kg/cm2) CAN BE CUSTOMIZED. From the relational drawing between tire and grounding area, we can understand the wearing condition from the surface of tire. Under Inflation (as above middle drawing): Two side of tire will be worn down. Rims will loss the protection from the tire and increase the chance of hitting the road. In this situation, it will become " deformed, broken", and even have severe tire brust. Over Inflation (as above right hand side drawing): In this situation, the middle of tire will be worn down very fast. The tire will loss traction when brakes the car due to lack of contact between tire and grounding area and also the decreasing of friction. The braking distance will become longer and it might cause the death by losing control. It is very important to check the tire regularly and it cannot be overlooked. The correct rire is not only about the comfort during driving, it will also extend the tire life. Important notice: Do not using the tire gauge when engine is running (heating) since the hot aire in the tire is unstable and it create the inaccuracy of measuring value.